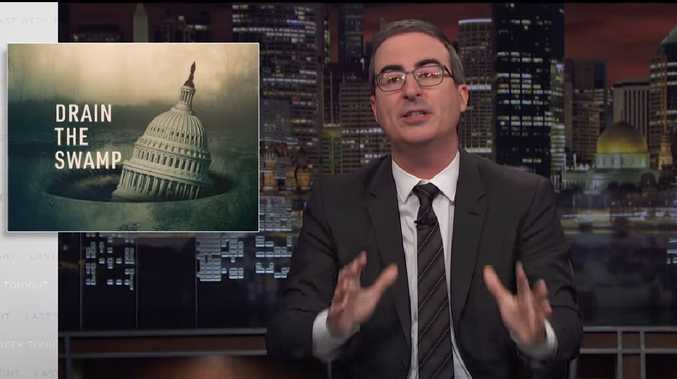 John Oliver has analysed just how much of a ‘swamp’ Washington still is. John Oliver has skewered Donald Trump over his claim to be "draining the swamp" in Washington, showing that he is instead doing just the opposite. The Last Week Tonight host said the President has repeatedly appointed multi-millionaires with questionable business interests to senior White House positions - and yet his supporters love the slogan. "Limiting the power of industry lobbyists and special interests is a genuinely good idea," admitted Oliver. "And while I would love to give him credit, the odds are, if your whole political platform is just screaming random three-word phrases, one of them is bound to end up being good. Lock her up? No. Build the wall? No. All dog zoo? Stop, that's actually a great idea." 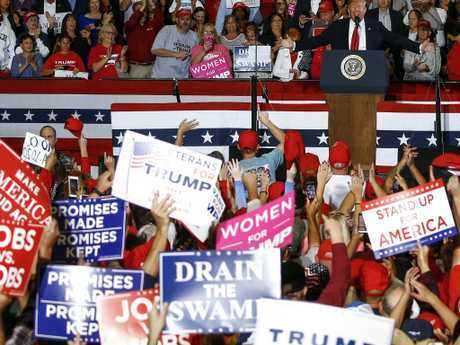 Mr Trump did not come up with the swamp phrase, but turned it into a sound bite that is now a regular chant at his rallies and often used by candidates. One clip even showed the President confessing he had thought the catchphrase meaningless when he started saying it - but it had caught on. "Trump has in no way drained the swamp - what he has done is drain the phrase of its original meaning," said Oliver. 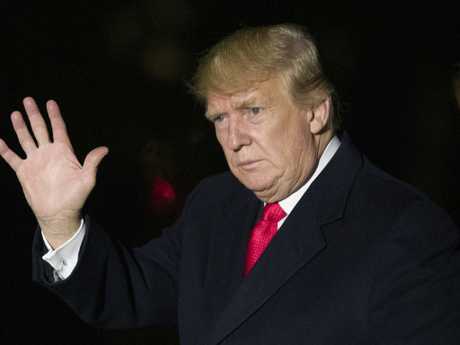 "It won't remotely surprise you to know that he has not drained the swamp one little bit. His Cabinet has included many swamp creatures, from these two Goldman Sachs veterans working on tax policy - Gary Cohen and certified handful of man-candy Steve Mnuchin - to Wilbur Ross - Commerce Secretary, wealthy corporate raider and living worst-case scenario of what can happen when Wallace Shawn is not stored at the proper temperature. "Trump has a laughable number of wealthy businessmen presiding over policies that could directly benefit themselves and their former employers and incredibly, despite 'drain the swamp' being one of Trump's greatest hits at his rallies, many of his supporters do not seem troubled by this." The TV presenter said "self-enrichment" was only part of the issue with the so-called swamp, which can also actively harm to ordinary people. "Real damage is being done to the 'small guy' by this administration's actions - take payday lending," Oliver continued. "People's lives can be destroyed by misleadingly marketed, high-interest loans, but the new acting head of the Consumer Financial Protection Bureau, Mick Mulvaney, has been actively working with the payday loan industry to block rules reining them in. "Why would he do that? I don't know. What I do know is that as a Congressman, he got $60,000 in campaign contributions from payday lending interests." He then showed a clip of Mr Mulvaney telling a room of bankers: "If you're a lobbyist who never gave us money, I didn't talk to you. If you're a lobbyist who gave us money, I might talk to you." Oliver went on to say it wasn't just the "famous alligators in Trump's swamp" causing damage, but also some of the lesser known bureaucrats. Some worked at the Environmental Protection Agency, previously run by Scott Pruitt, who spent $43,000 on a soundproof booth in his office, tried to get the CEO of fast food restaurant Chick-Fil-A to give his wife a franchise, and demanded a 24/7 security detail to drive him around town to find which Ritz Carlton had the moisturising lotion he liked. "He was not an isolated case," said Oliver. "Nearly half of the political appointees hired by Trump at the EPA have strong industry ties." Andrew Wheeler, Pruitt's replacement, earned more than $700,000 in recent years as a coal lobbyist, and "pushed hard to roll back environmental regulations impacting the industry," the TV host added. Oliver said the problems filtered all the way through the White House, pointing to Secretary of the Interior Ryan Zinke - who rode a horse to work on first day, took 66 days leave in his first year and has been the subject of 15 investigations.